In recent years, renewable energy has been on the rise in the United States. Still, the overwhelming majority of our energy comes from fossil fuels. And, renewable energy needs to overcome significant limitations and obstacles to contribute a greater share of our overall energy solution. Hydrogen fuel cells may be the key to our sustainable energy future. The term "cell" as it relates to energy is associated with batteries, but a fuel cell is more like an internal combustion engine. That's because while a battery stores energy, highly-efficient hydrogen fuel cells generate power using a reverse-electrolysis chemical reaction. And, they are environmentally friendly—producing only electricity, water and heat. So how come they aren't currently used everywhere? After all, fuel cells have been used in NASA space shuttles since the 1960s. Indeed, the technology has improved by leaps and bounds since then. Unfortunately, like with renewables, the world still isn't completely ready. 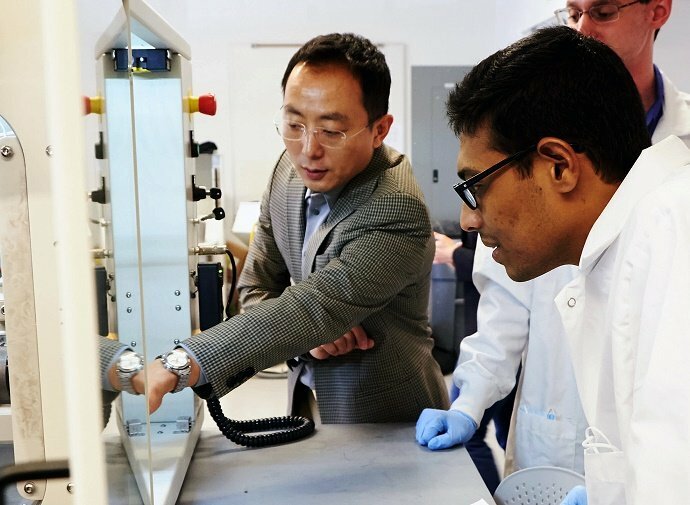 However, Associate Professor Jeongmin Ahn in the College of Engineering and Computer Science says that the landscape is changing rapidly and fuel cells may soon emerge as a viable alternative in many applications. "Given the genuine obstacles that the implementation of fuel cells used to face, past policy decisions in the U.S. heavily favored renewable energy and battery-powered electric vehicles," says Ahn. "But today, things have changed in a way that makes widespread adoption of fuel cells much more feasible." Those who prioritize other energy solutions over fuel cells have traditionally pointed to a few key problems: hydrogen production is expensive, hydrogen is difficult to store—especially on a vehicle, and there is little existing infrastructure. According to Ahn, these common objections don't hold up the way they once did.